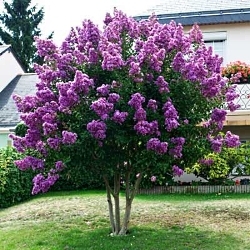 This slower growing deciduous tree flowers lavender pink in late spring. The flowering continues off and on until fall making this a nice colorful addition to the landscape. 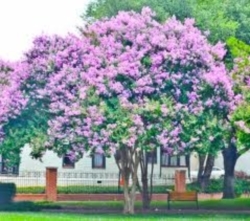 Plant as a specimen tree or in groups along a property line. Can tolerate drought conditiions and attracts hummingbirds and butterflies. 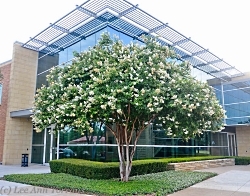 Geronimo is a more cold hardy variety of crape myrtle with its beautiful red flowers and interesting peeling bark. Can be grownn as a small tree or large shrub. Beautiful when mass planted. Heat and drought tolerant. 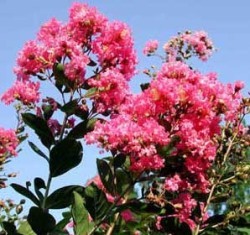 Large, deciduous shrub or small tree with smooth, cinnamon-brown exfoliating bark. 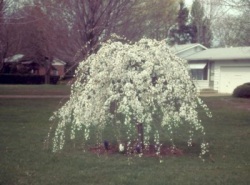 Pure white flowers bloom all summer. Glossy, dark green leaves turn a vibrant orange-red in the fall. Excellent as a specimen, accent or group planting. Deep wine colored leaves emerge in spring then age to dark purplish-green, providing a striking contrast to vibrant pink summer flowers. 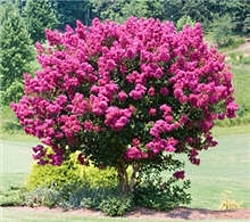 Its compact, multi-stemmed form is ideal for use as an accent shrub or small tree. Deciduous.